The first hospital of Seychelles was a wooden building located in the centre of Victoria (Etablissement Du Roi). It was constructed sometime in the 18th century, (after 1778) not far from what is now the old Bel Air Cemetery, up what is now called Revolution Avenue. In the 19th Century, the Hospital moved to the location of what is now called the National House up the Mont Fleuri Road. Rumours have it that National House is haunted today because so many patients died in the area when the hospital was located there. Seychelles Hospital is at its current location, further south along the Mont Fleuri Road (Hermitage), since the 1920’s when construction of the hospital began. Incidentally, there is no connection between the location of the hospital at Hermitage and the name Hermitte Ward given to the female Surgical Ward. 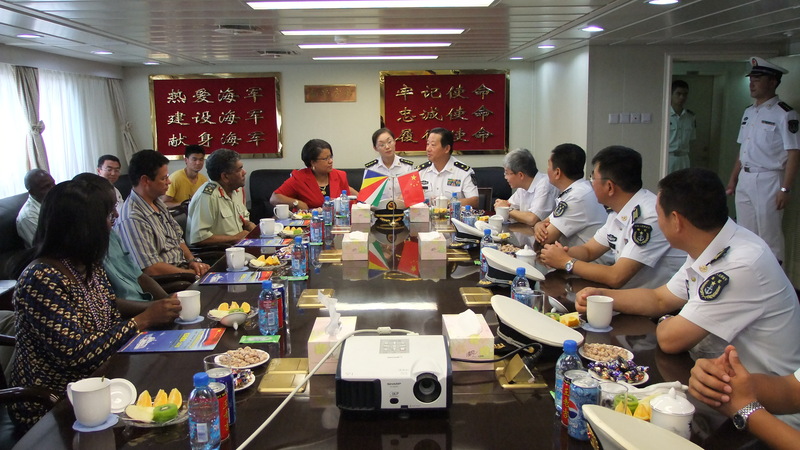 The Minister of Health of Seychelles, in 2010, meeting with the leadership of the Chinese Hospital Ship, the Peace Ark. The Peace Ark was on a goodwill visit to Seychelles with a large number of medical personnel. This entry was posted in News Updates and tagged Seychelles Medical and Dental Council.